Why settle for a plain, unflattering bathroom mirror with a boring frame when you can have a much more unique mirror instead? So without further ado, here are some of the top ideas when it comes to jazzing up your bathroom with these bathroom mirror ideas. Choosing the Best Bathroom Mirror Ideas. 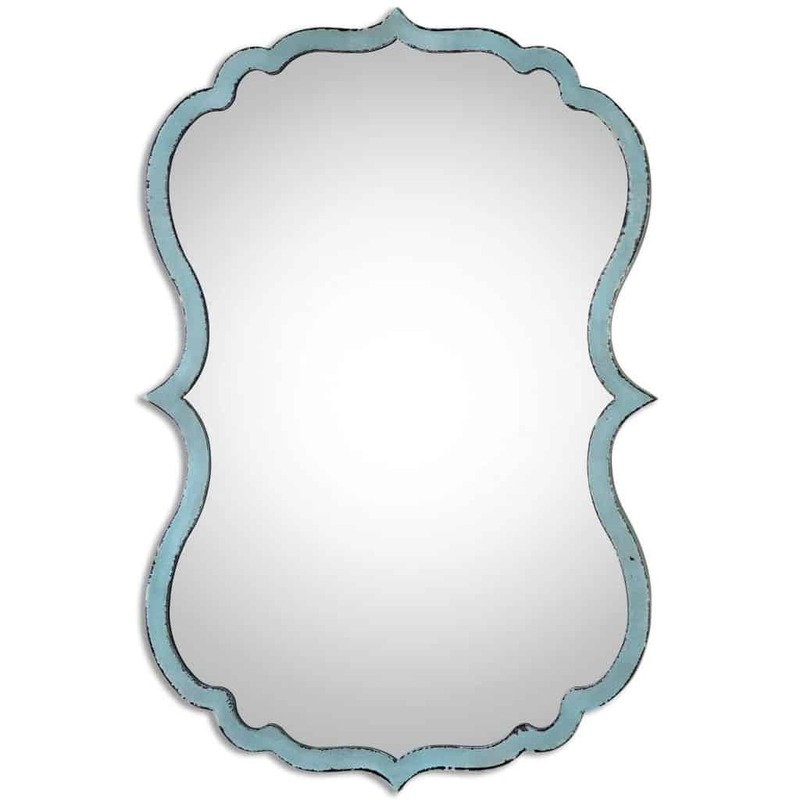 Find a bathroom mirror style that matches your decor. Here are some of the most popular options. 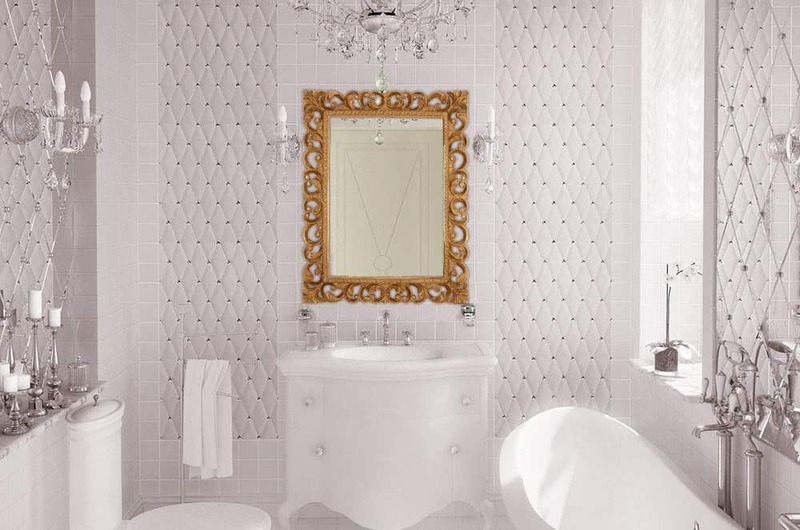 Say no to the usual metal frame for your bathroom mirror and say yes to mirror mosaics as your mirror frame. This is a great idea for a bathroom mirror or a vanity mirror. Small bits of glass placed creatively along the sides of your bath mirror will create a stylish and creative look. 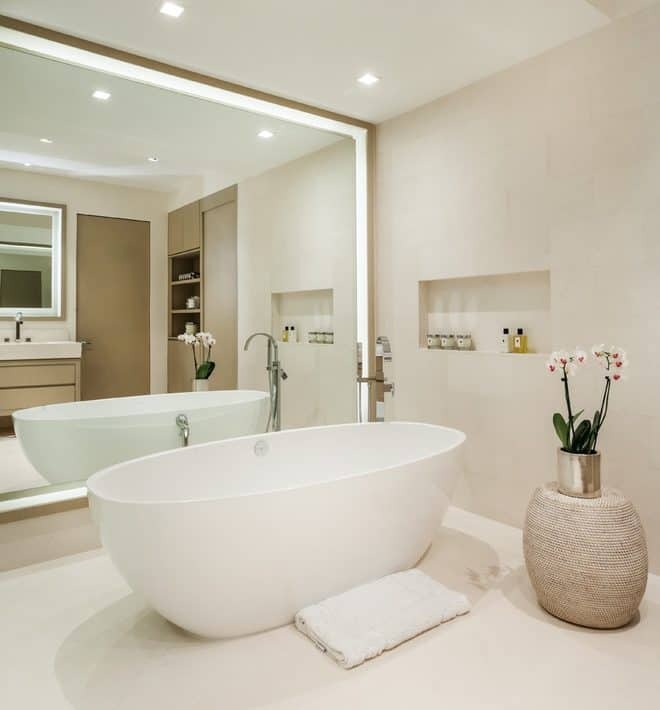 Add modern lighting and you can make this area of your bathroom easily stand out. 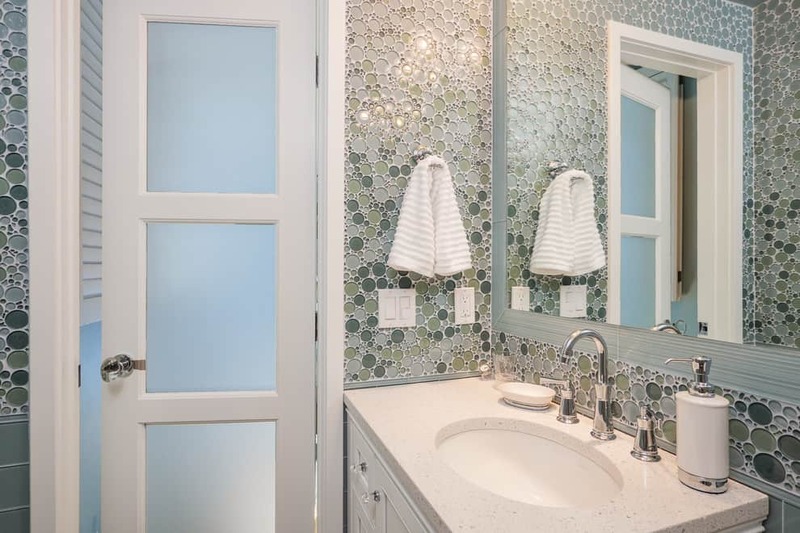 Glass or mirror mosaic pieces will also illuminate your vanity and make your mirror a great conversation piece too. 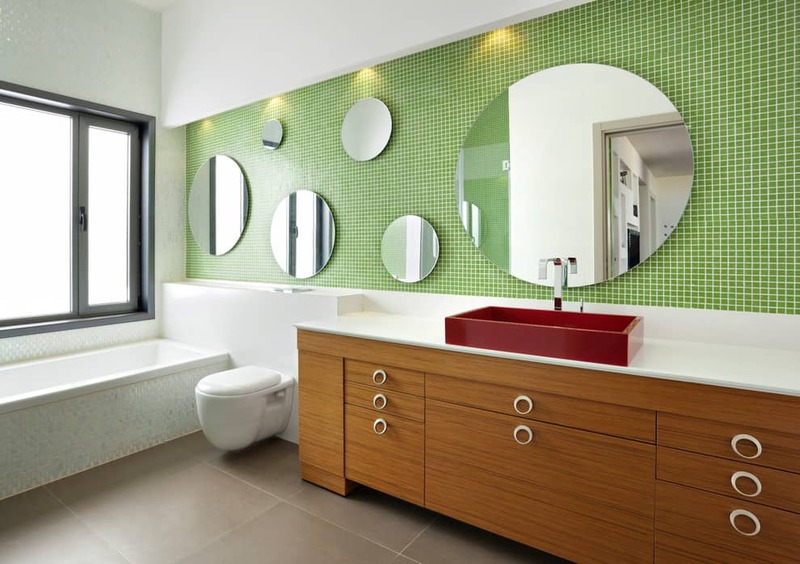 You can choose from the usual rectangular or large square bathroom mirror ideas. 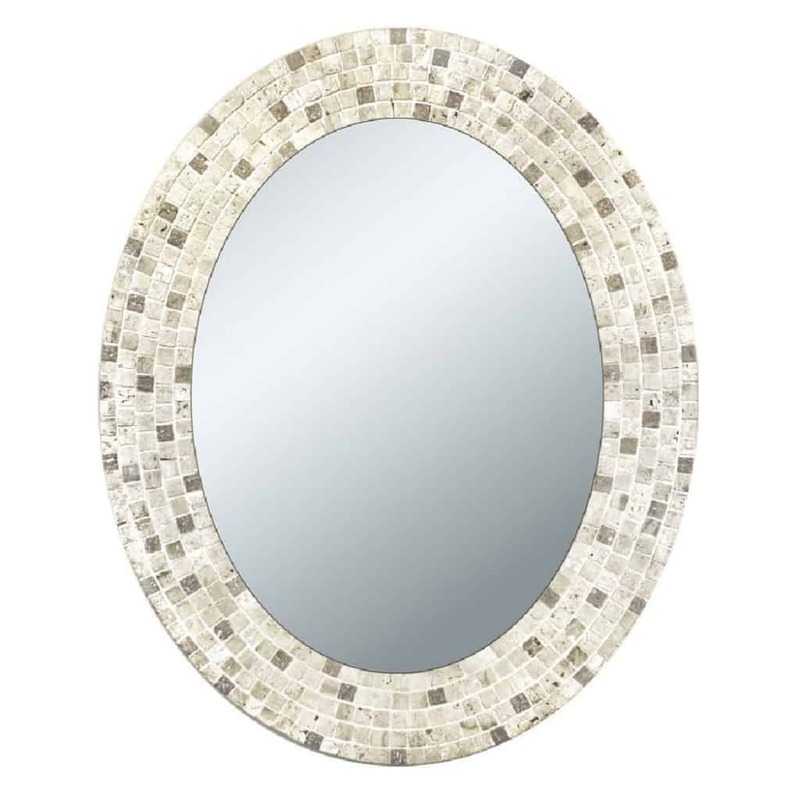 Or you can choose an irregularly shaped mirror with a glass or mirror mosaic frame. This frame is a work of art, covered in oxidized Copper squares. It’s a very beautiful, large mirror that will look great over your sink. 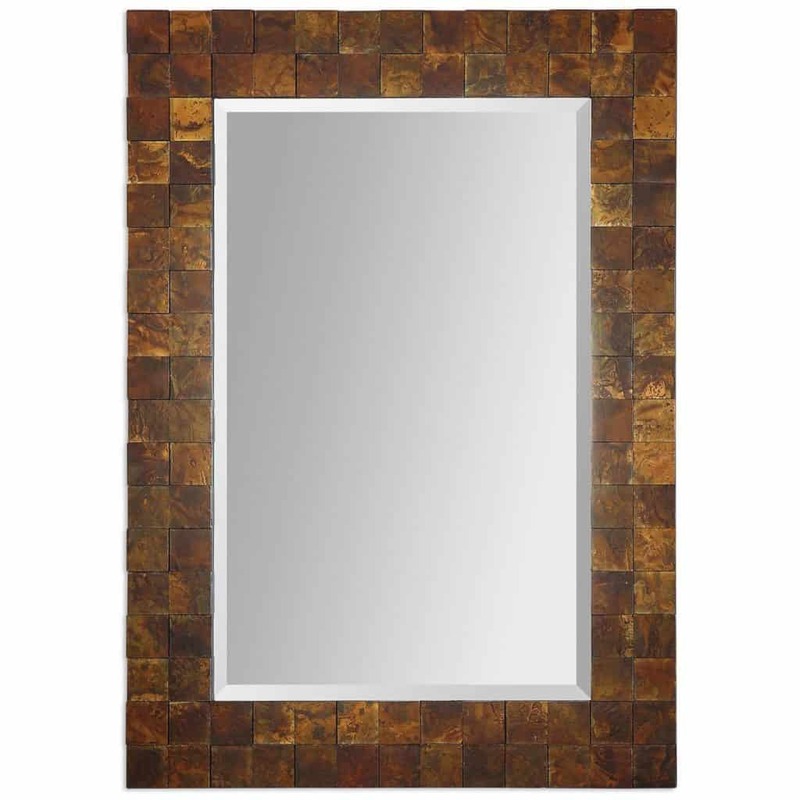 This mirror is hand inlaid with an impressive mosaic travertine stone tiles. It will certainly add a focal point to your bathroom. You can see the great craftsmanship and attention to detail. 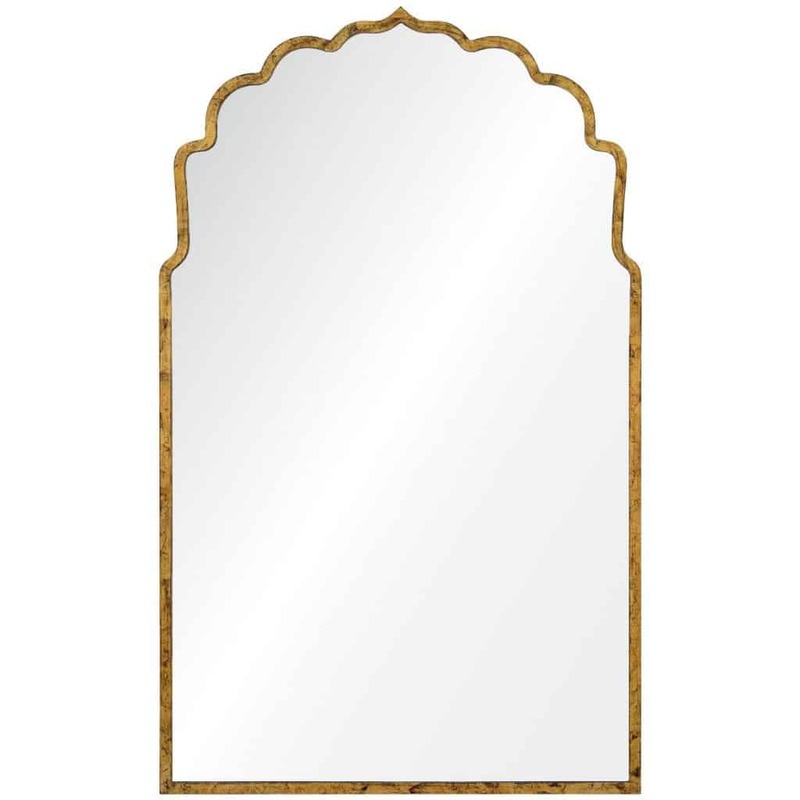 This elegant mirror will look really rich and luxurious on your bathroom wall. This mirror is embellished with glass tiles in “shimmering shades of earth and sea”. 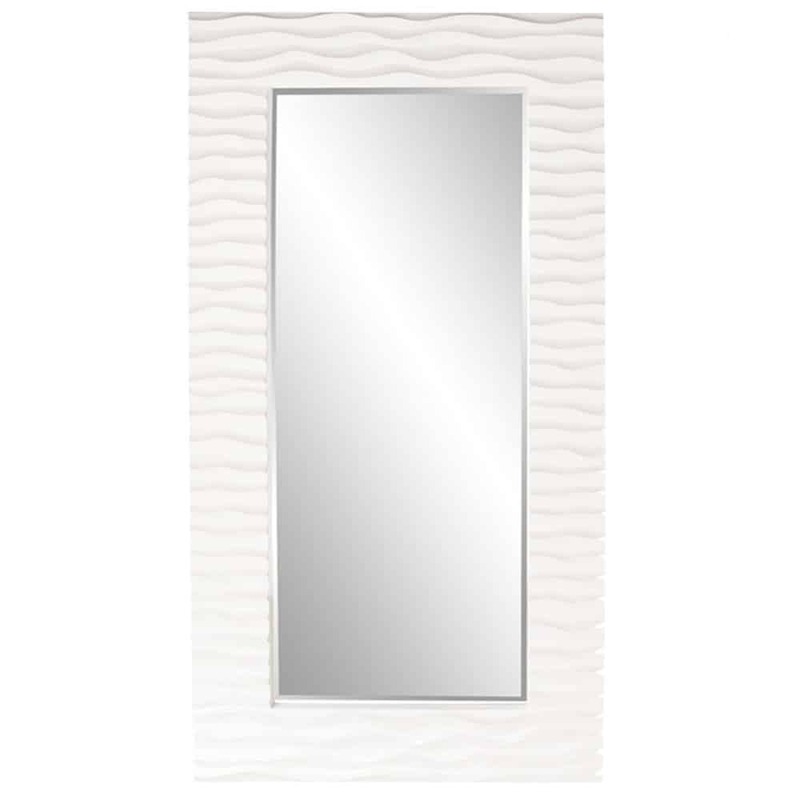 It’s a beautiful, original looking designer mirror that will make your bathroom “pop”. 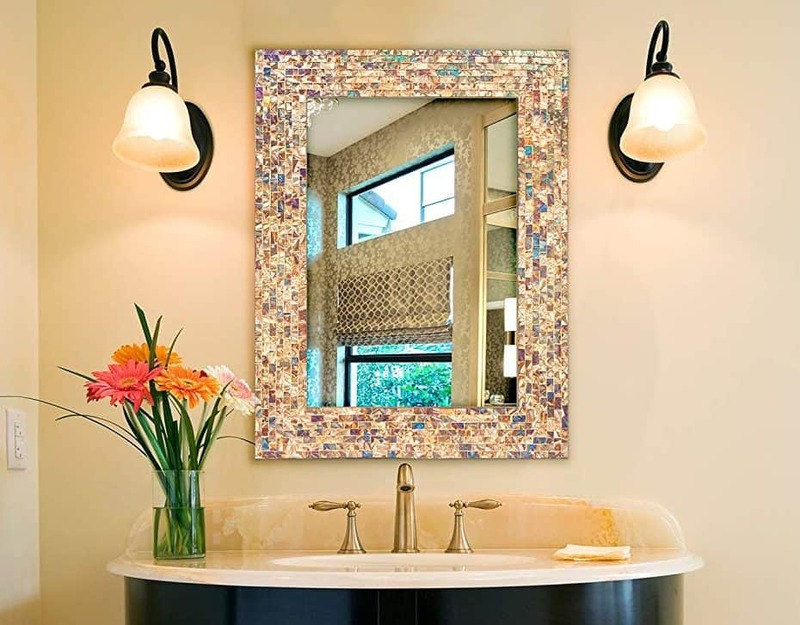 This hand-tiled glass mosaic mirror will make your bathroom shimmer. It’s neutral in color so it will match any color scheme. It’s a heavy and well-made mirror. With these bathroom mirror ideas, you can create a tile backsplash with your bathroom mirror embedded in it. This is a really cool way to improve the appearance of your boring plain rectangular mirror and transform it into a beautiful vanity piece. Take 1×1 ceramic tiles with a totally contrasting color from your bathroom tiles or wall color to create a backsplash frame. You may choose one color or two or more depending on your design and your tastes. Create a mosaic pattern with your small ceramic tiles or you could even make use of larger tiles as well. 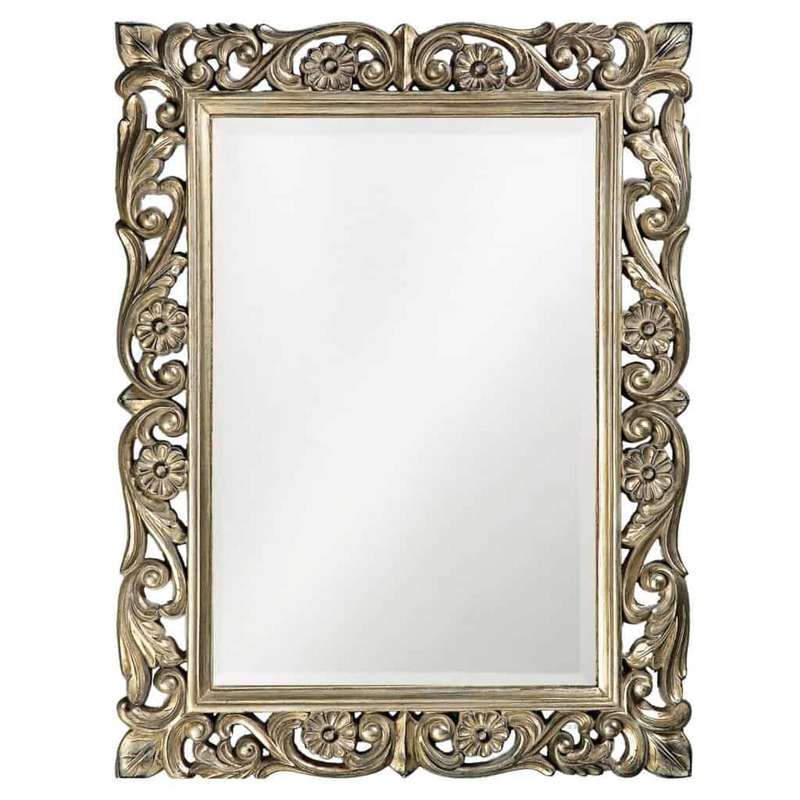 An antique design frame would work well for a classic bathroom theme. 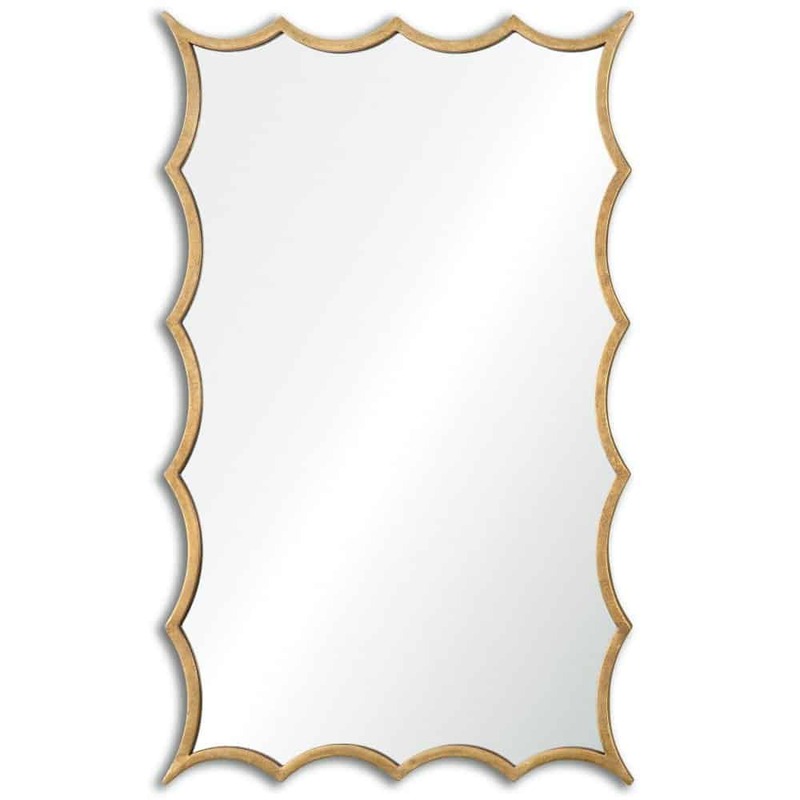 A huge plain rectangular bathroom mirror can be framed with treated and varnished or painted carved hardwood creating a classic and seamless design. Your frame could be as narrow as 1 ½ to 2 inches or make it 3 or more for a much larger frame size. Your frame can also be any color. You can contrast the frame color to your bathroom tile color and design as well as your wall color or you may use any color combination you wish. 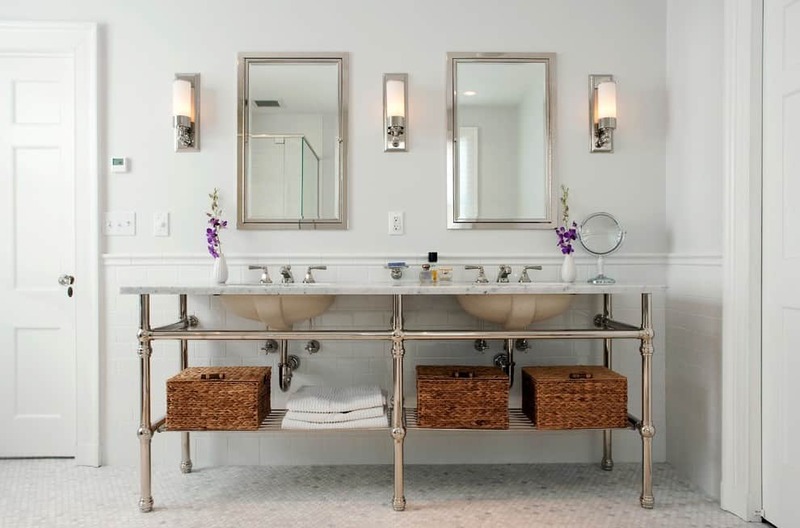 Any of you bathroom mirror ideas including an antique mirror frame design should complement your existing plumbing as well as lighting fixtures in your bathroom. 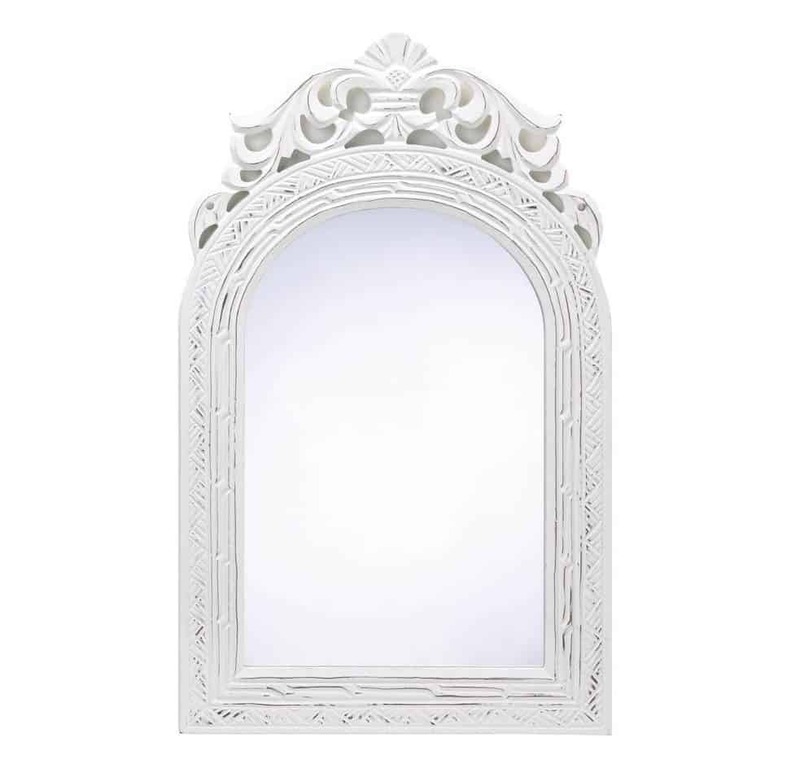 This ornately carved mirror features has a lovely open scroll design with three flowers at the top. It’s a unique and well-made mirror. 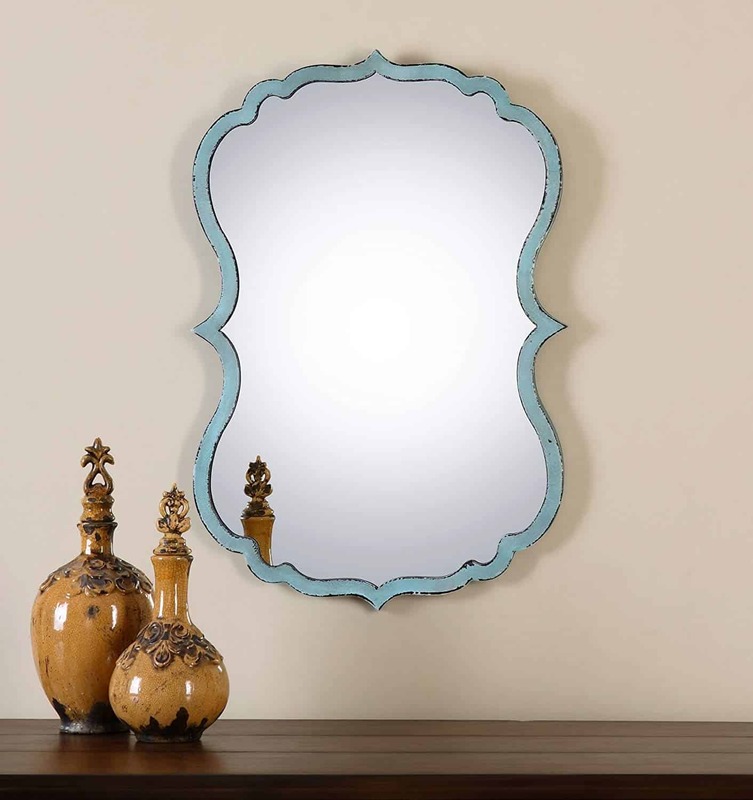 This gorgeous mirror will show your guests that you have great taste in detail. It’s beautifully ornate, with quality craftsmanship and classy design. 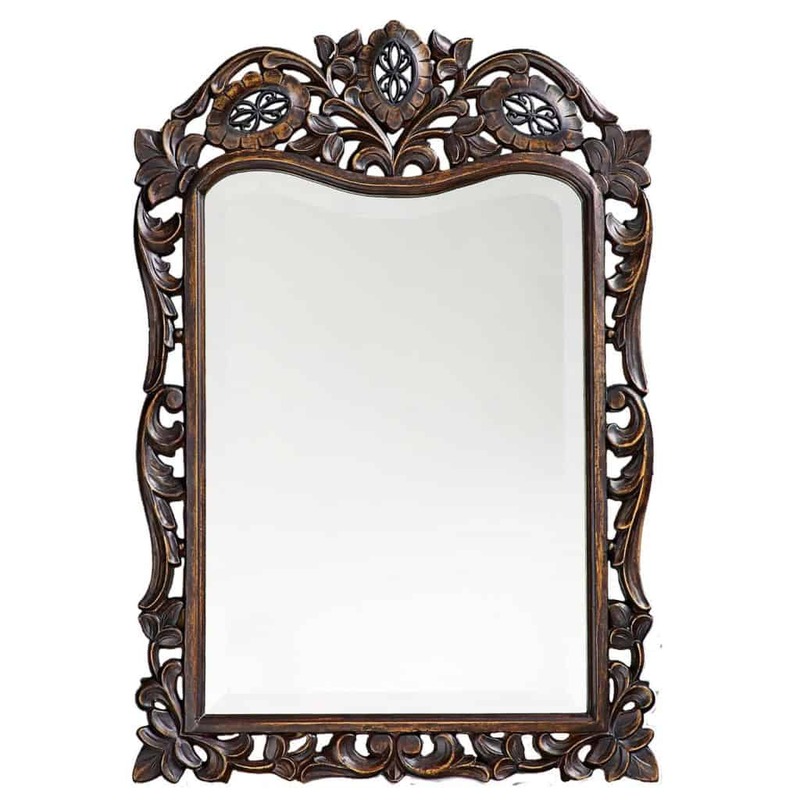 This is a wood-framed, french-country, vintage-style, weathered, and distressed mirror. It’s good quality and well made. 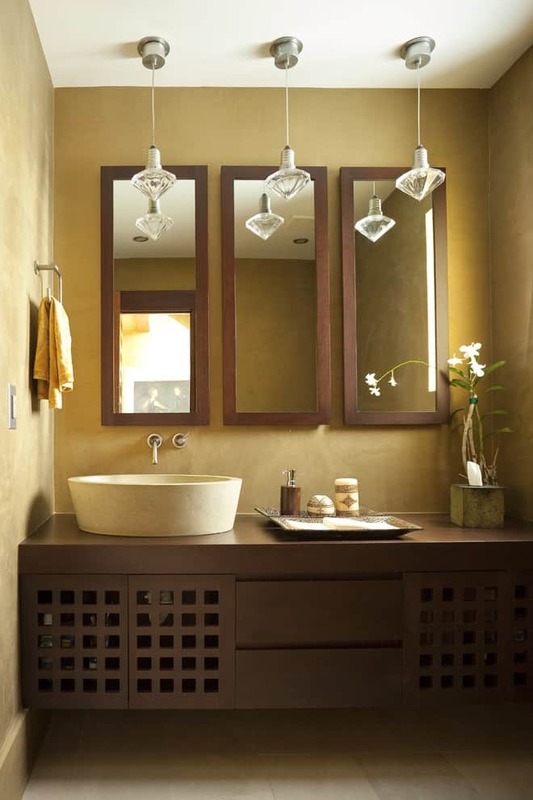 Irregularly-shaped mirrors are very popular in modern-style and boho-style bathrooms. 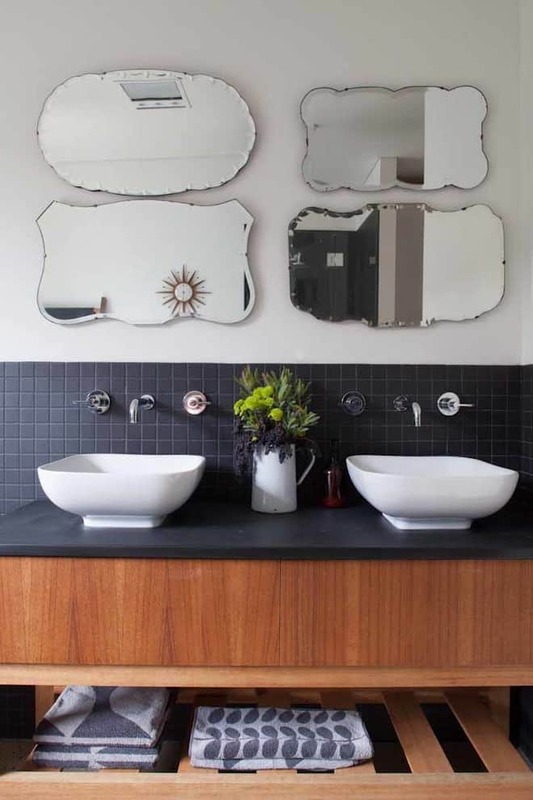 Irregular bathroom mirrors are a perfect way to improve the look and the feel for any type of bathroom. 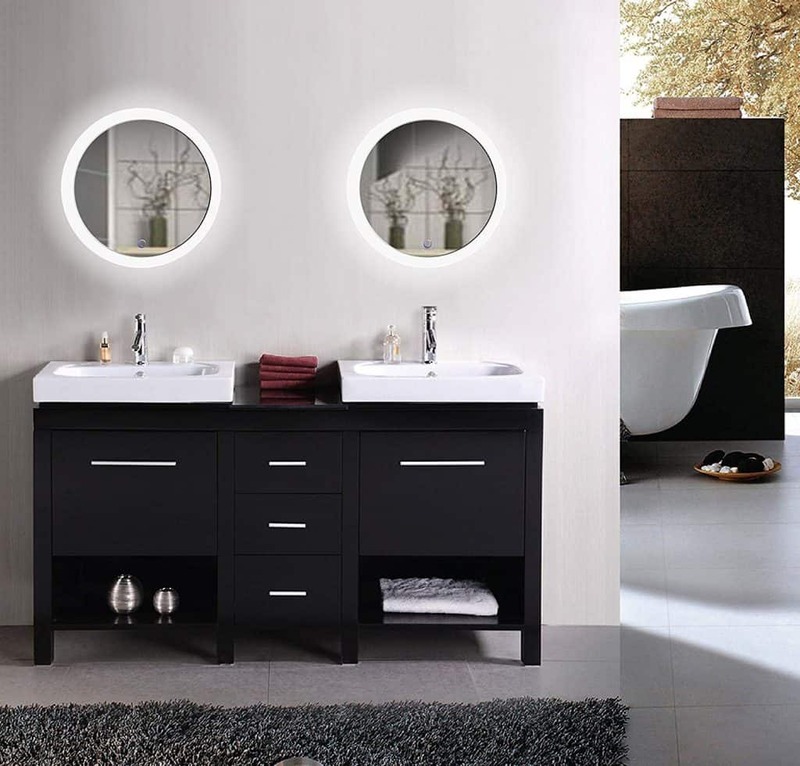 Choose from bathroom mirror ideas with a wavy edge and frameless design. Or choose a beautiful ornamental piece with curved seamless corners. These modern-looking bathroom mirror designs will look great no matter how small or how large your bathroom is. 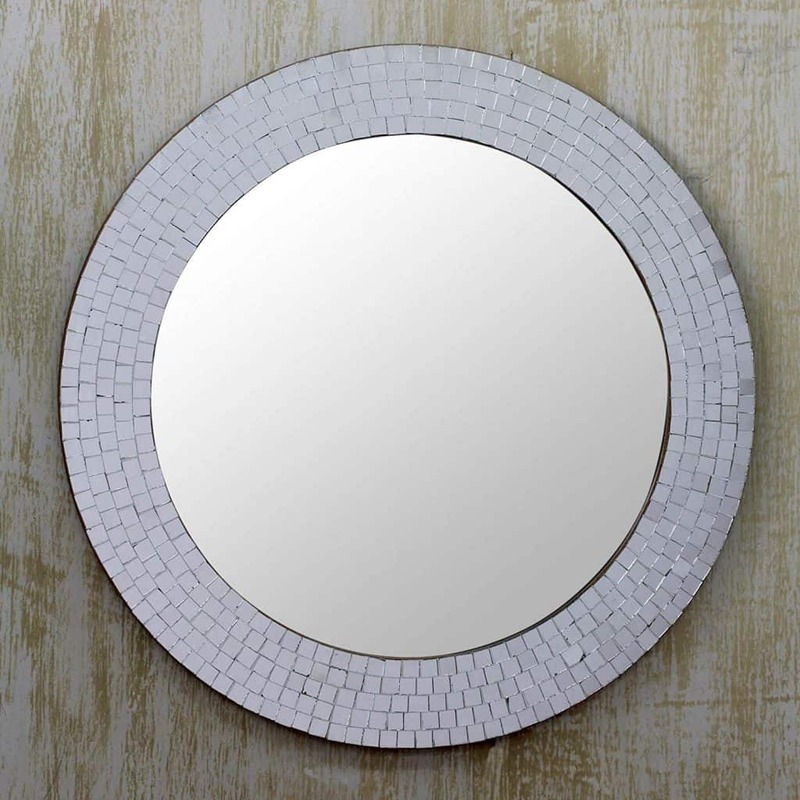 This mirror has a unique classic curved shape and a distressed look. It is hand crafted and hand finished. It’s perfect for a vintage style vanity. 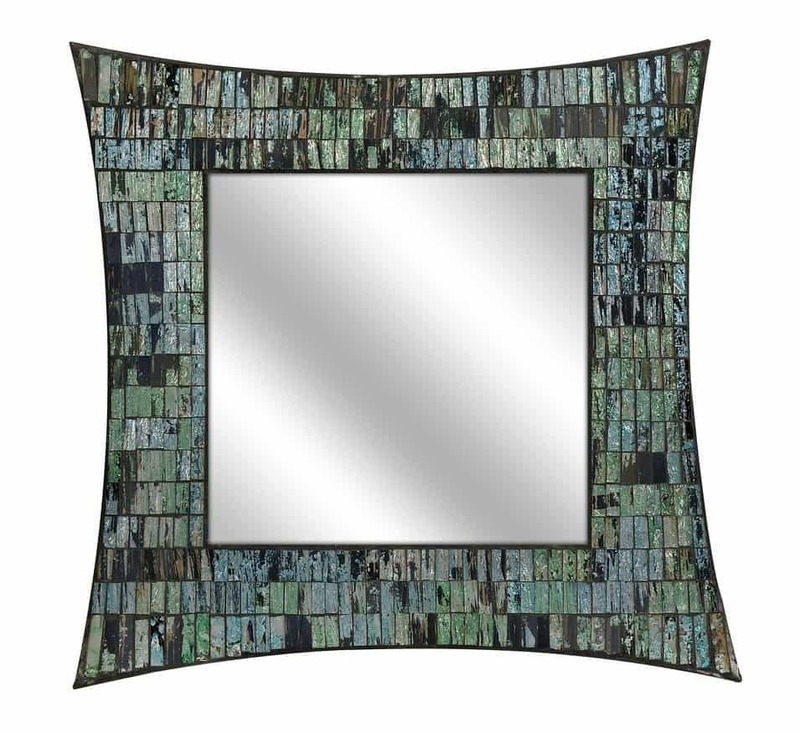 This large mirror features a wavy, hand-forged metal frame. It reminds me of a Ka-Pow punch graphic from the classic Batman TV show. 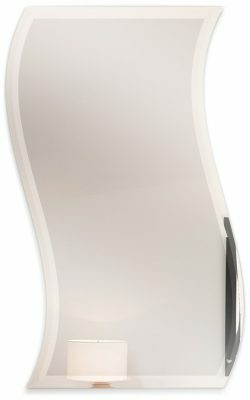 This is an elegant frameless, classy and unique wave mirror! Constructed from iron and wood, this mirror was inspired by a lotus flower. This mirror has the cool wavy ripple effect. It’s hand finished and would fit horizontally over a double sink vanity. 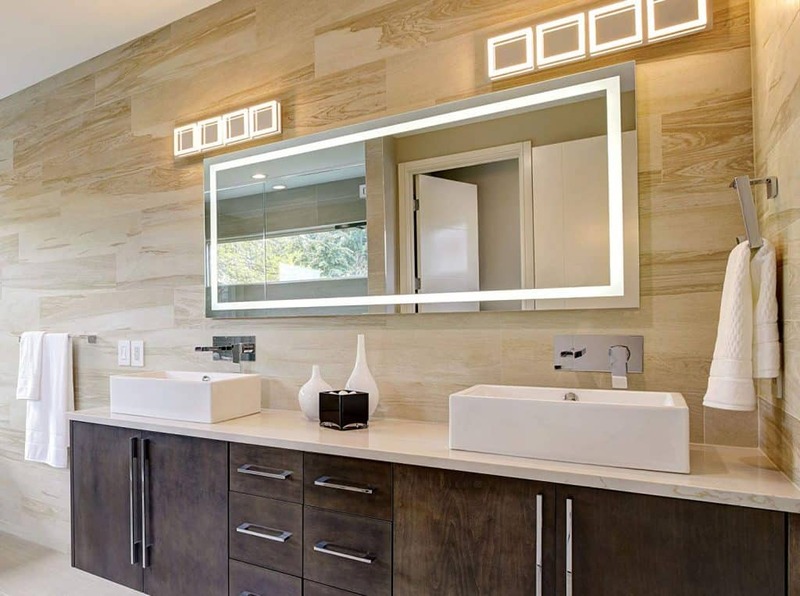 Instead of using track lighting or spot lighting to illuminate your vanity mirror, these bathroom mirror ideas allow you to get creative with your bathroom’s lighting. A back-lit mirror replaces traditional lighting above your vanity mirror, because it provides lighting from behind the mirror. This creates a ghostly but futuristic effect in your bathroom. This mirror idea is perfect when you have a large boring old mirror that needs to be reinvented. Also instead of white fluorescent lighting, you can use other color tones such as light green, light blue, rose or lavender. Here are the most popular backlit mirrors. This round Sol bathroom mirror features ambient LED illumination and a defogger to keep the bathroom mirror free of after-shower fog! This is a beautiful LED backlit mirror. It has a push button on/off switch. Why use a single, boring, large mirror when you could use smaller mirrors to fill the space? This will not just make your bathroom mirror more interesting but will also add depth and style. A large bathroom mirror could be replaced with three smaller mirrors arranged to fill the exact same space. Or have fun playing with different mirror designs and use different kinds, colors, and sizes of mirrors. 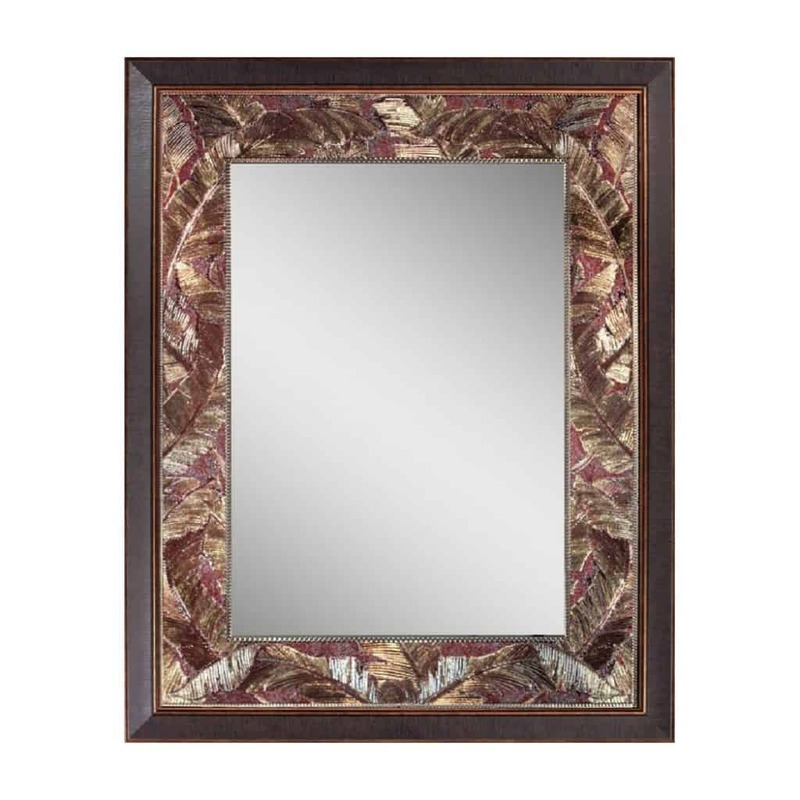 You can purchase mirror sets in home furniture outlets online and offline too. Looking for fun bathroom mirror ideas for a children’s bathroom? There are fun bathroom mirror designs such as under the sea themes, flower and insect themes, zoo animal themes and cartoon character designs such as the characters from the popular Nickelodeon cartoon series SpongeBob Squarepants. 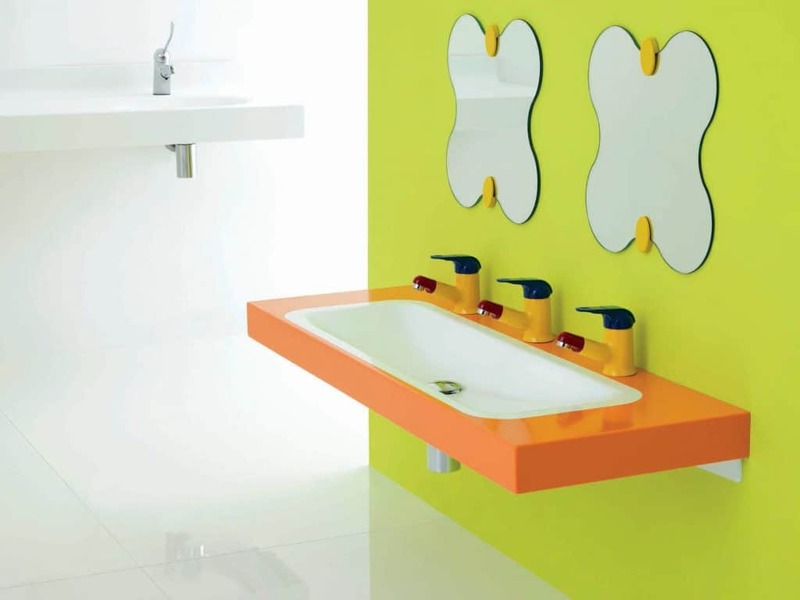 Watch as your child’s eyes light up in excitement as he finds cool characters on his bathroom mirror vanity! Complement these fun mirror designs with cute bathroom vanity accessories with the same theme such as tissue paper holders, soap and shampoo dispensers, soap dishes and towel racks. Some bathroom mirrors extend far from the bathroom vanity or from the bathroom sink. These mirrors are bigger and definitely better! Found in posh bathrooms of hotels, stylish homes, and vacation homes, large full-length mirrors will never be out of style. 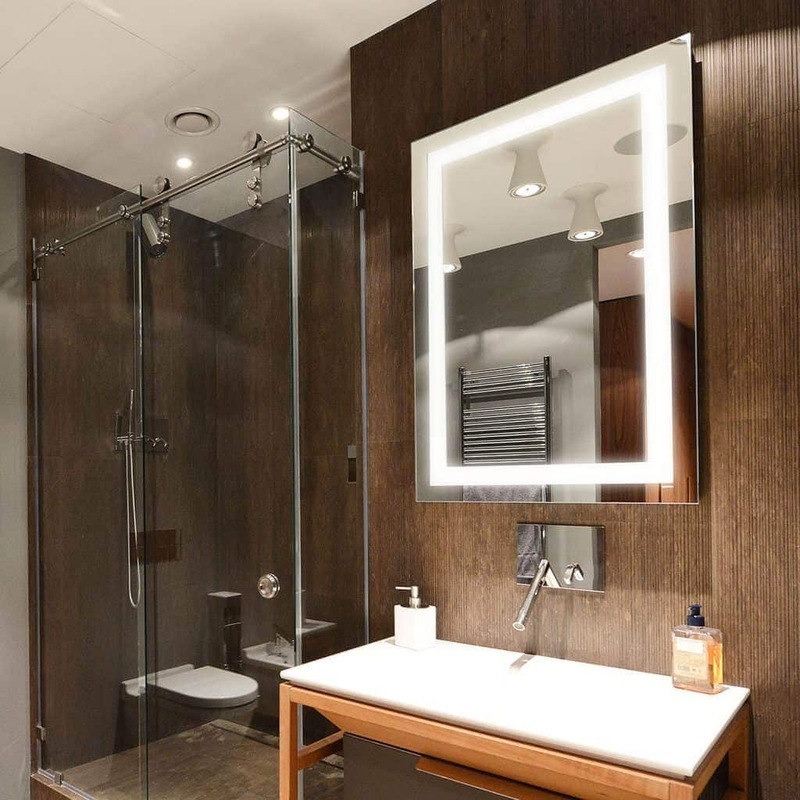 Huge bathroom mirror ideas are perfect for dressing up or simply admiring how you look after a shower. 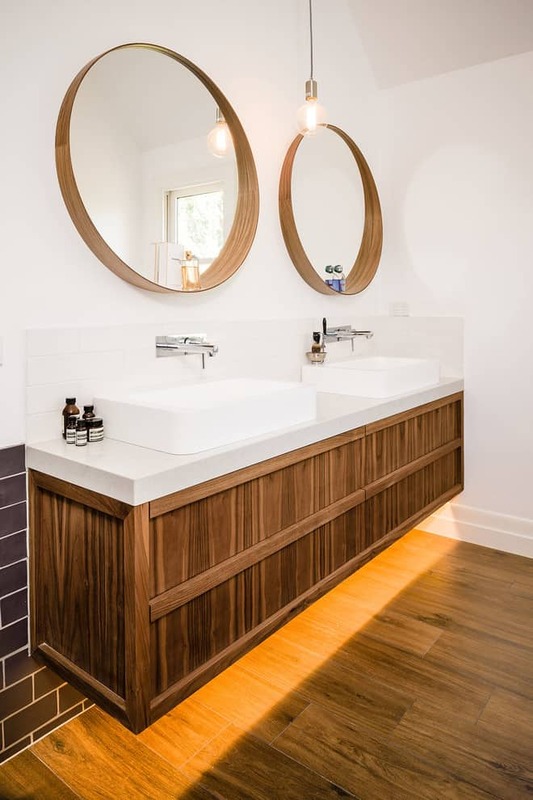 And of course, don’t forget that mirrors make small spaces appear larger and therefore this idea is a worthwhile bathroom upgrade. The glamour of Hollywood is in your bathroom! Transform an ordinary bathroom vanity into a theater-like dressing room by placing large incandescent light bulbs along the edge of your bathroom mirror. 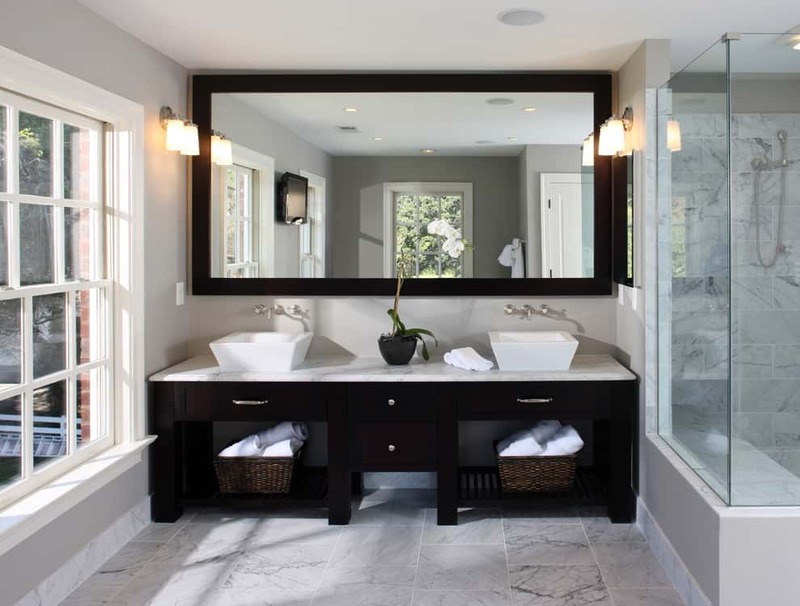 These great bathroom mirror ideas would work great for large bathroom vanity mirrors. 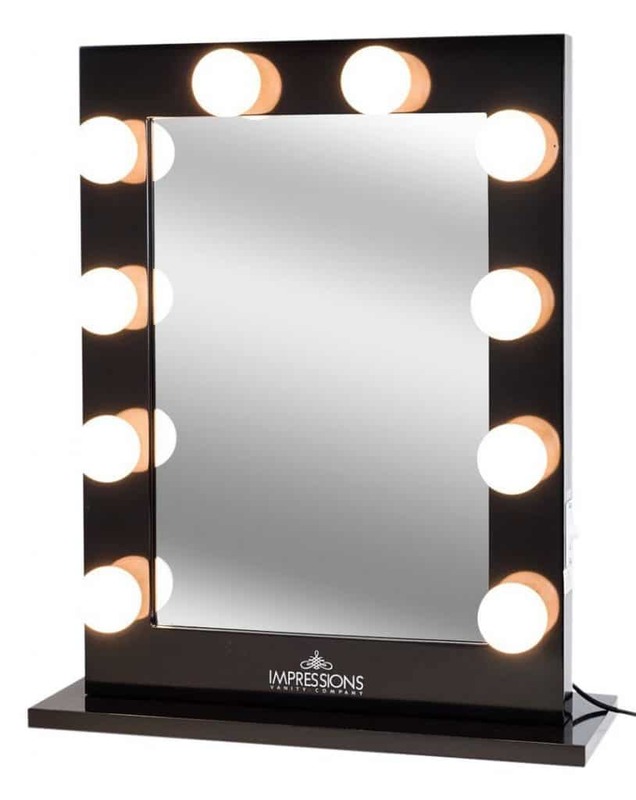 A Hollywood-style mirror with lights will not just make your bathroom look stylish but will also help improve lighting conditions; ideal for dressing up or applying makeup. These bathroom mirror ideas could be your next do-it-yourself project this weekend. Simple mirror makeovers such as updating your old bathroom mirror is easy. 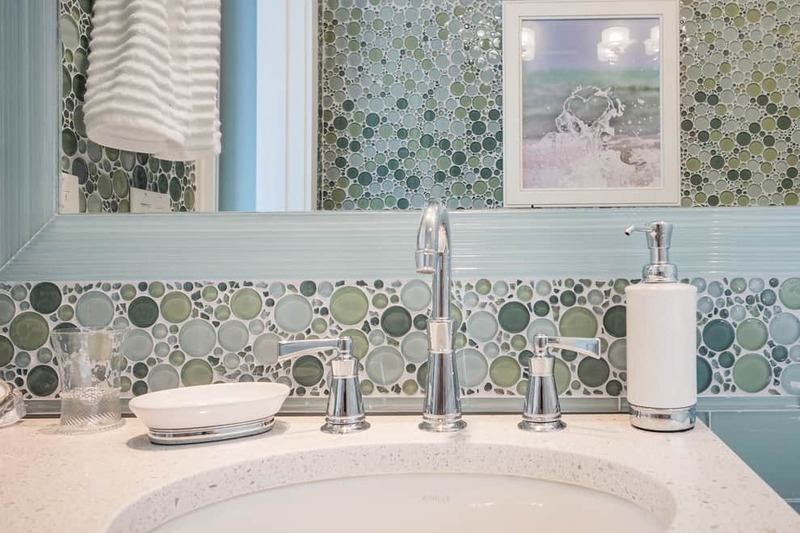 Some mirror ideas might be a little more complicated such as creating mirror mosaic edges could take a weekend to complete, but are still worthwhile bathroom upgrades. You can also update your bathroom by changing your wall color, upgrading your light fixtures and your plumbing fixtures. In fact, there are so many ways to make your bathroom the most impressive room in your home; all you need is time and the patience to do it. For more bathroom ideas be sure to read our popular 200+ Bathroom Idea Guide. 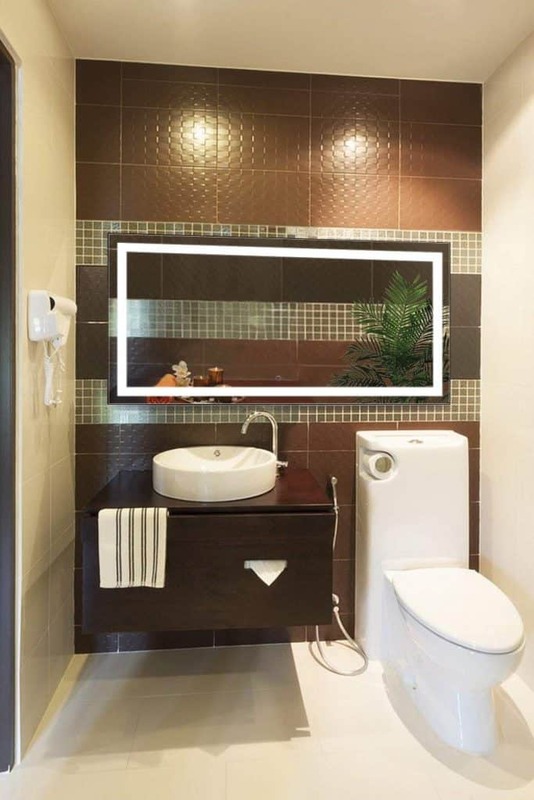 Very good post because people want to know new ideas about Bathroom Decoration.In my opinion, Vanity Mirrors or LED Bathroom Mirrors give some extraordinary eye-catching look to your bathroom. Many different styles and shapes are available as you’ve shown in your post. 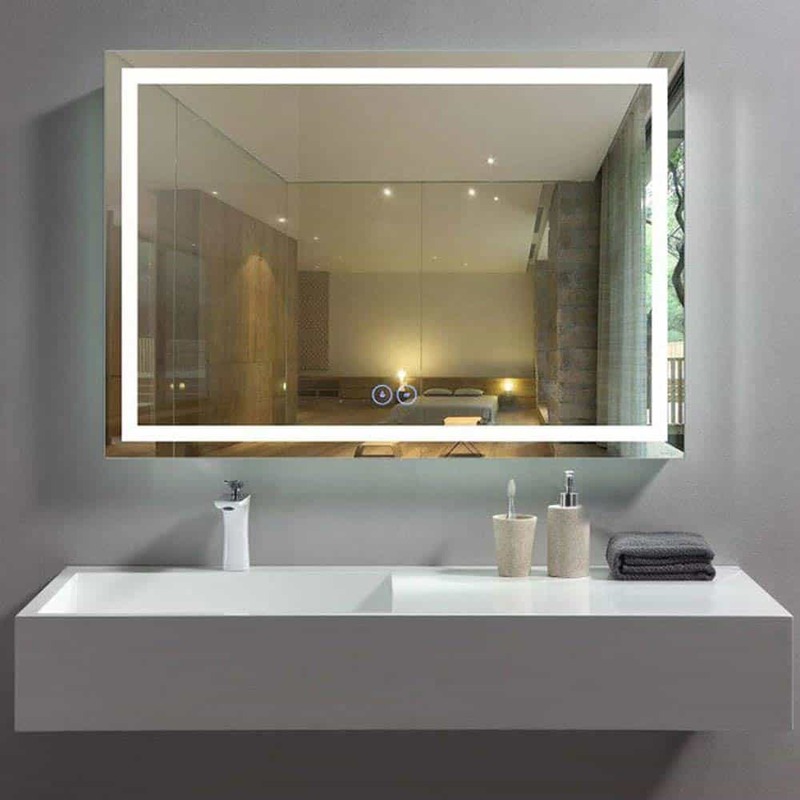 If you have enough space then you can also use LED Mirror Cabinets because it not only give a stylish look but also increase the storage capacity of the bathroom. Thanks for the extra info. LED Mirrors are really awesome! A mirror with LED lights is always the top choice when it comes to high quality lighting and getting the best reflection.